A geoglyph is a large design or motif produced on the ground and typically formed by clastic rocks or similarly durable elements of the landscape, such as stones, stone fragments, live trees, gravel, or earth. 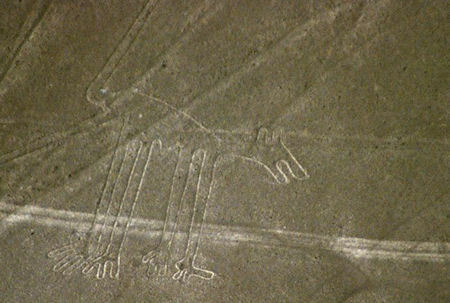 The most famous are probably the Nazca lines, the enormous figures of people, animals, plants, and geometric shapes scribed into the ground in southern Peru. But the Nazca lines aren't the only ones. Geoglyphs can be found all over the world.